Mickleover Sports were founded in 1948 and spent the first 44 years of their history playing local football in the Derby & District Senior League. In 1993 they gained promotion to the Central Midlands League - Premier Division. They won promotion to the league's Supreme Division 2 years later and by 1999 had been promoted into the Northern Counties East League at Division 1 level. After 4 seasons in that league, they went up again, after winning the league in 2003. Their rapid progress continued and it was double promotions in 2008 and 2009 as they were champions of both the NCEL and the NPL D1 South. Despite finishing 15th in their first season in the NPL Premier, they were relegated the season after, and only survived a second successive relegation by the skin of their teeth as they finished 21st back in the lower league of the NPL. They stabilised however and after finishing 5th last season and losing out in the playoffs to Belper Town, they are currently 6th, having been on a good winning run lately. In the FA Cup, they are close to beating their best ever run this season. Previously in 2010, they beat Retford United and S&L Corby before losing out to Newcastle Town in the 3rd Qualifying Round. Success in the FA Trophy has been pretty much a non-starter although they did get to the 3rd Round of the Vase on a few occasions. They have a couple of smaller cups to their name - the NPL Presidents Cup and the NCEL League Cup. It was FA Cup Replay week again and so if possible, I was looking for a game in that competition if at all possible. There were a few decent ties, but they were all a fair way away. Happily, Anwar was back to keep me company and help out with fuel costs, and between us, we chose one of the nearer ones - Mickleover Sports v Bedworth United. It was actually a continuation of the first FA Cup game of this season that I had seen. Staveley Miners Welfare had triumphed over Worksop on that Friday night. They went on to beat Rainworth Miners Welfare in the Preliminary Round. Just as they were getting into their stride they came up against Mickleover Sports in the 1st Qualifying Round. I was hoping that the game would be moved to the Friday night, as had many of the games. 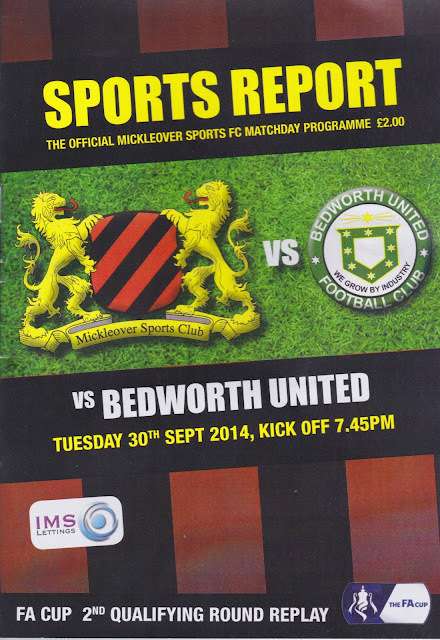 But sadly it was not to be and Mickleover triumphed 3-0 over the NCEL side. Then on Saturday, tonight's sides played out a 1-1 draw down in Bedworth, to set up tonights replay. As usual, it was my day off on Tuesday. Usually, I am sat around, waiting to go to football and doing various things to kill time, but I did something useful for once, going down town and getting my hair cut. I used to go to an Asian place that was in some random part of town, but since they started closing on Tuesday's I have found a decent one near the town centre called 'Chaps'. It's a couple of quid extra but it's nicer, and they have a really friendly dog there. I then came home and killed the rest of the time by going on the internet and watching TV. I left a little bit earlier than usual for Aylesbury because I wanted to check in their Sports Direct for a pair of slip on trainers I fancied. They didn't have the exact ones I wanted but I got a pair of Velcro ones and they were only £9. I met Anwar and his mate Scouse Carl who was making his debut on one of our groundhops. Traffic was very slow getting out of Aylesbury, then again through Milton Keynes, and once more on the M1. All in all, there was around 30 minutes delay. We needed food and so stopped at a pizza place called Pizza Tonight on the way. I had a hot and spicy pizza and it was excellent for the £4 that I paid. From then on it was only 10 minutes to the ground, arriving there around 10 minutes before kick off. I paid £10 entry and programme and also bought a pen from the club shop for £1.50. I had a brief chat with another groundhopper Chris and got some pictures of the ground. I then took a place on the other side of the pitch to watch the game. At half time it was getting a bit chilly so I got myself a cup of cracking home made minestrone soup which was easily the nicest hot drink I have had inside a football ground. Mickleover had accounted for the wonderfully named Thurnby Nirvana and the wonderfully friendly Staveley Miners Welfare so far, so perhaps I should have been rooting for Bedworth. But really I was hoping for prnalties. In any case, the hosts dominated the first half and were good value for their lead at half time. The second half was a different story though, with Bedworth having much the better of the opening exchanges and being unlucky not to equalise. The game turned on a sending off and a penalty mid way through the half. There was a foul in the area, and as the player was the last man, he walked. The resulting spot kick was put away well and Mickleover never looked back from there. They added a 3rd when the goalkeeper messed up and was stranded and lobbed to round the game off. A fair result in the end. I drove home after briefly getting lost on the one-way system in Derby City Centre. There was around 20 minutes added to the journey, what with diversions and traffic on the M1, but even so we still got back to Aylesbury by 11.55. After dropping Anwar and Carl off I was back home within 20 minutes. As usual, after a night of football, I couldn't get to sleep for ages and only ended up having around an hours sleep, which left me feeling jaded the following day. I'd been to The RAYGAR STADIUM before, back in 2007. Some rather hopeless navigating by my mate Paul meant that we went about 15 miles out of our way due to having to divert due to delays on the motorway. Either which way, now that I was in Mickleover, I was going to take a look at the ground and was impressed by the ground, which was then an NCEL venue at step 5. There were a couple of areas of cover, a seated stand holding around 300 and cover for 350 standing fans, while the rest of the ground was open. It would be interesting to see if there was anything added since my last visit when I went there for a game. I wasn't sure if the cover behind the goal had been added, as I do not have a picture of that end from my last visit. In any case, it adds cover for around another 350 standing fans. Around a quarter of the ground is closed off to fans, due to them also playing cricket there. The club shop was good, offering a decent range of club stuff and also old books and programmes. The clubhouse offered real ales and a range of other drinks, though I didn't indulge on this occasion. The tea bar offered a small range of food, mainly burgers but the minestrone soup was home made and delicious. The people at the club are really friendly and the ground is worth a visit.